Hope they do well for you. I doubt you need to worry much about heat loss at this time of year and it is only an hour drive. They should be just fine in the styro box. I do love cory cats and I had great experiences with them, even breeding them. No need to be concerned as they are non-aggressive. Bronze are the C. aeneus and the albino, I believe are the same species. They are easy breeders so a colony this large may mean... you know. Cory cats and guppies go together like spaghetti and meatballs. The will eat what ever food the guppies miss and keep the tank clean. But the corys still need to be feed there own food as leftovers alone is not enough. Hope it works out as there great fish. They should all be peaceful. Really excited to see these Shell. 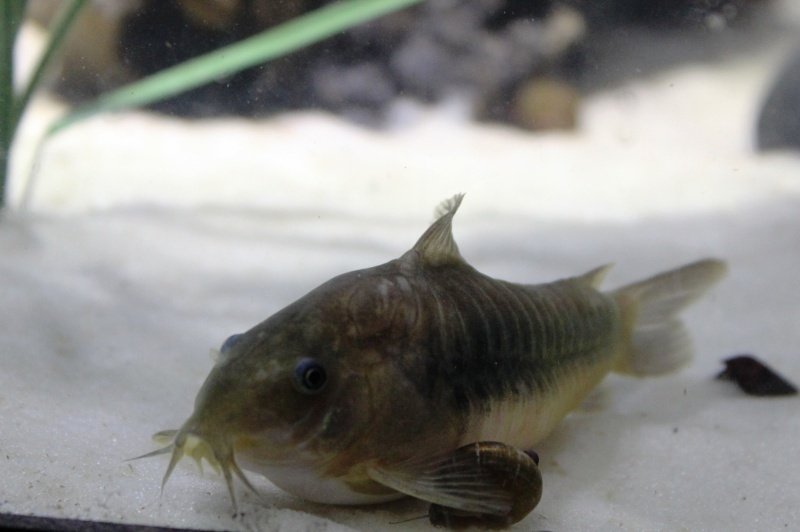 I really do love Corydoras. 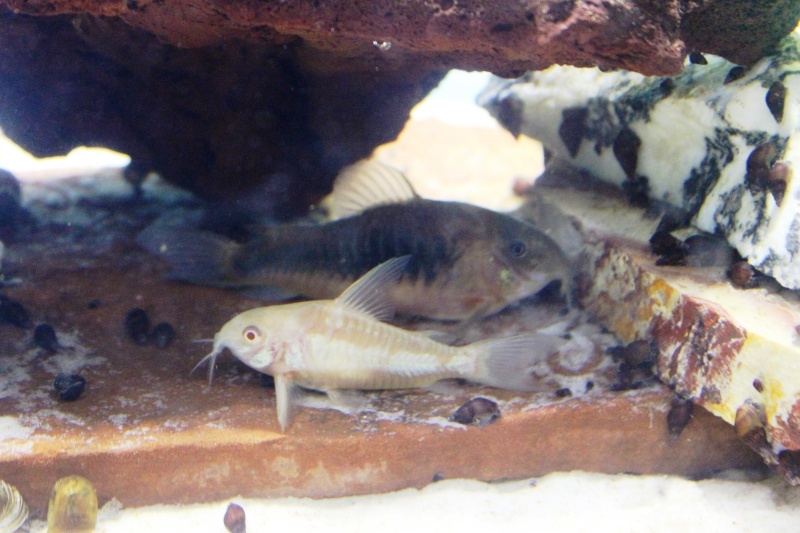 The albinos are quite possibly Corydoras aenus, but I've heard of albino forms of Corydoras paleatus, and recently saw albino Corydoras sterbai. Picked up the cories today, the gal is moving and so it was busy at her house. She handed me the bucket and told me there were more fish than she thought in her tank, so I took the bucket and off I went. I got home, opened the bucket and saw several HUGE cories, 2 zebra loaches, and one small mystery fish!! I immediately began acclimatizing, then got the cories into the 20g. I was in such a frantic mood that I honestly did not even count the number of cories! I did notice 2 albinos, and I think a few high fins of some sort. One looks either really fat, or full of eggs. Some of these guys are massive....they make the guppies look like ants. I truly hope they will not hurt my guppies. After I got them in, I almost wanted to take them out as the size difference is just crazy. I then hurried to drag out a 10g (loaches were not in the plan! ), added the little sand I have here (covered maybe 1/4 of the tank bottom! ), filled it with water, some from the 220, some from the bucket they came in, and some from the well. Grabbed some filter media from the 55g, added some colony liquid, threw in a small piece of driftwood and a horrific looking fake rock/plant combo that I had here, and then transferred the loaches and mystery Fish in. I think the mystery fish might be a baby guppy. I did not, however, want to add it in with our male guppies as I'm worried it might be a female, and I'd hate to see the little thing get bullied by two boys. 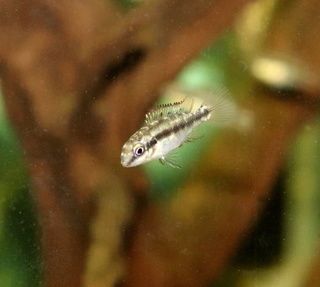 The lights are still out in both tanks, but I managed to get a slightly viewable pic of one of the corydoras. Wowsa...this was a crazy day! Edit: oh my gosh, I just read that zebra loaches do not do well in newly set up tanks! Crap, now I have this to worry about! Problem is, the 20g is just too small to add them, too much competition with the cories, plus, they just might think my guppies are brine shrimp! I'm going to work on getting the 55g set up, and will add them in once ready and cycled....if the poor little guys hold on for me! Lots of new fish. It looks like from the picture you have a Corydoras sterbai there, and peaceful and personable fish. Are they all the same (other than the albinos)? 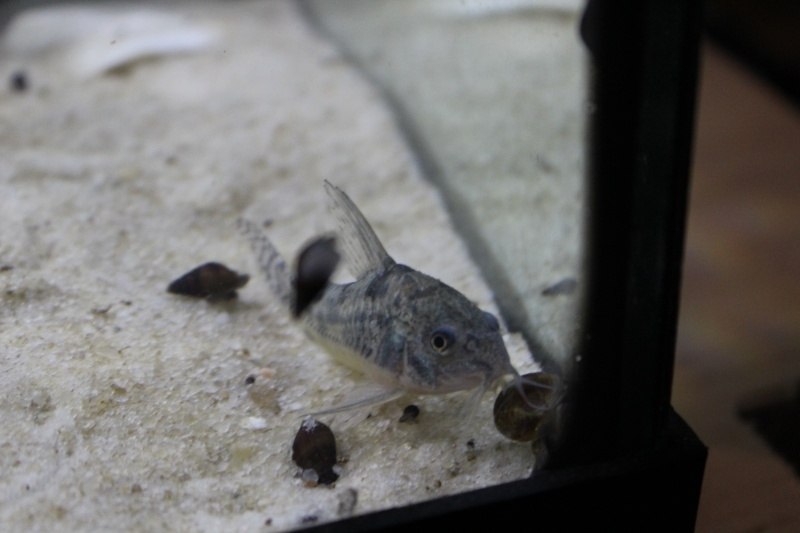 I think you had mentioned getting some Corydoras aenus. I looked at Botia striata (your zebra loaches) prior to getting my dwarf chain loaches, and they should be a neat fish for you. I believe Biulu keeps/has kept them? I hope they do well for you. Exciting and stressful to end up with so many different little ones. Very cool, lots of new fish. Hope all goes well, get some more pictures when you can. I was able to count, and there are 10 cories. They are sooooo big - I'm now concerned that the 20g is just not big enough for them. One of them is just so fat as well! All 10 are swimming around like mad now, and the guppies keep trying to chase them - I am seriously worried the guppies are going to injure themselves....do they not realize how small they are and how BIG the cories are?! At least two are albino, one has sort of a polkadot pattern ( the one in the pic), and the others are bronze and 'two-toned'. Once the lights are on tomorrow, I'll have a better description...and pics! 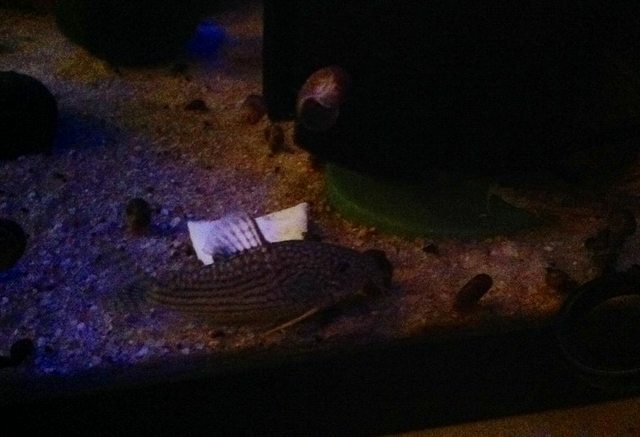 A brighter picture will 100% confirm, but I'm pretty certain they are Corydoras sterbai . CanadaquariaAdmin wrote: A brighter picture will 100% confirm, but I'm pretty certain they are Corydoras sterbai . That is what I am thinking too. Certainly looks like it. Looks like a sterbai to me too. Do you see a yellowish tone on the side fins? Don't worry too much about the zebra loaches; they are tougher than you think. Just make sure that the water doesn't have ammonia. These fish are shoalers and you will see them much more often if you can get them to be in a group. I think you are all right, definitly sterbai. The others look more brownish, and I saw that one has polka dots, but not streamlined, more sporadic and splotchy, if that makes sense! I can't wait to get some photos! The zebra loaches 'sound' like huge fish...I keep hearing a lot of splashing coming from the tank - I hope they are not trying to escape - my heart would break if one got out. They are super active, but one looks dull and is not as curious as the other, more vibrant one. Where this is a new tank, might I change water daily until things look good, or just test daily and keep my fingers crossed? I hate that they are in an uncycled tank. 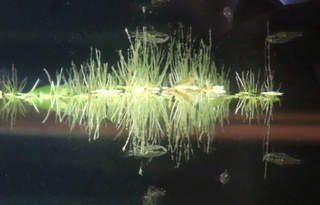 Transferring established media and adding bottled bacteria does something, but not enough in the end I suspect. Just do more water changes than usual in the first 2 weeks to come and you should be alright. @Biulu wrote: Just do more water changes than usual in the first 2 weeks to come and you should be alright. Will do. My gut was telling me this, for sure. Everyone looks good this morning. Getting ready to turn on the lights to get a better look! Just noticed this, congrats, Shell!!! 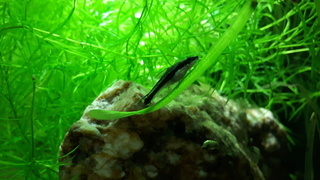 I LOVE cories and have them in several tanks. Thanks nyleveiam - they are all doing great so far!!! And, this pic is blurry - but it is just to show the big size difference between the guppies and cories! 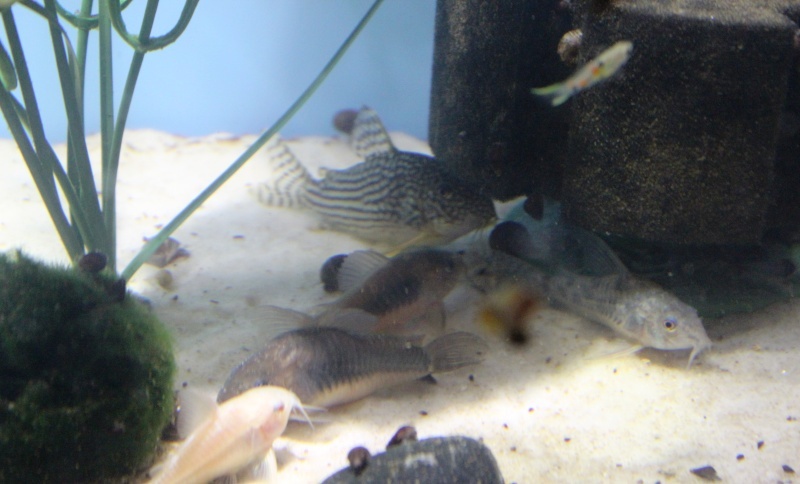 I'll get some pics of the loaches soon - they are soooo funny to watch, and so cute - and quite noisy, I must say! 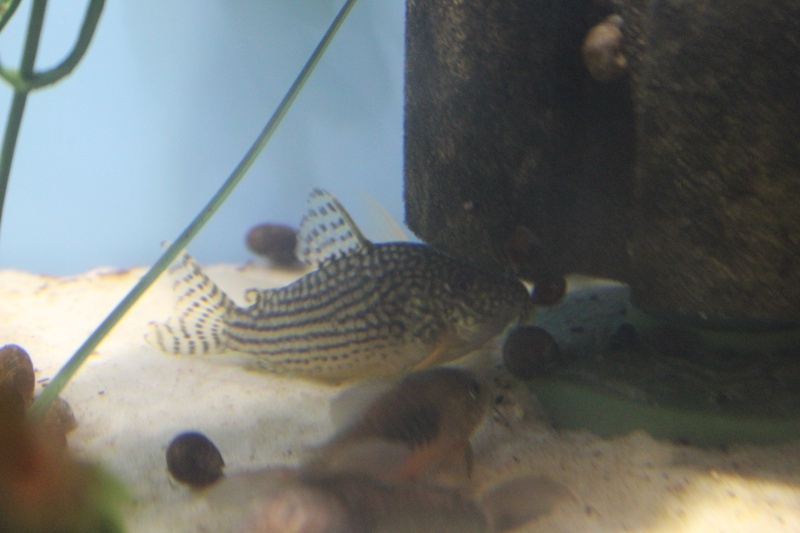 I think that you have a Corydoras paleatus there too! I'm seeing at least three species, paleatus, aeneus, and sterbai. That's a big sterbai too. Congrats on the latest additions. Cories are so cute. Nice to see have a good sized group. They are such social creatures. It's fun to watch them all hang out together. Thanks Jay. After seeing these guys interact, I actually wish we had more friends for Callie, our panda cory. But whatever disease took her barbels, and took her tank-mate's lives, I just can't take the risk. She is so active, despite being alone, and so this keeps me happy. I still can't get over how small Callie is compared to these new cories! Wow! Ps - i told you that one guy was fat! 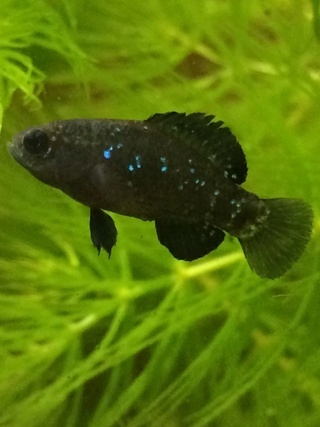 Do you think she/he is overweight? Or something else going there? Who knows how old these guys are...I'm guessing not young though! She is sooo big and adorable - We have named her "big momma"
Actually, full of eggs. She is well conditioned and could probably spawn by the looks of it. Two weeks of conditioning with blackworms and a cool water change would trigger it.